Two weeks ago at this time I was sat on my balcony in Gran Canaria, staring out at the serenity of Salobre and soaking up my final day in the sun. Today I’m wrapped up in my dressing gown and watching the leaves fall in the garden. I’m still not ready for Autumn. Maybe it’s because I finally have that Summery glow most people have been walking around with for months or perhaps it is because in my head I’m still in holiday mode. All I know is that I am still choosing pretty dresses over trousers for work and shorts over jeans at home! My Month | At the end of August you may remember that I decided that the Ketone plan just was not for me. I developed the same flu like symptoms that have been associated with dropping your carb intake too low and generally wasn’t finding food fun anymore. I switched back onto a Carb Cycle, eating low carb meals two days a week and then high carb ones on the third. It works for me and I enjoy the meals I can create on this type of plan. I headed away weighing in at 54.6kg and feeling amazing. Of course I headed away and enjoyed my week in the sun, all the Cava and Carbs I could get my hands on and came back to the UK almost 2kg heavier. Oops. Ever since I got back I have struggled with getting my head back in the right place when it comes to eating well and working out and so far I’ve managed to only lose a quarter of what I gained. Oops again. But whilst I was away I read a great book by Mel Wells and I think I have finally made a little peace with myself, my lifestyle and my eating habits. So I’m not beating myself up over it, I’m accepting that sometimes life gets in the way and moving on. This week I found my spark after attending a Barrecore workout in Leeds at their new studio above Sweaty Betty in the Victoria Quarter and I am now looking forward to getting back in the gym and putting together some fantastic meals again next week. My Workout of the Month This month I think I need to break away from the norm and put two workouts out there to you! 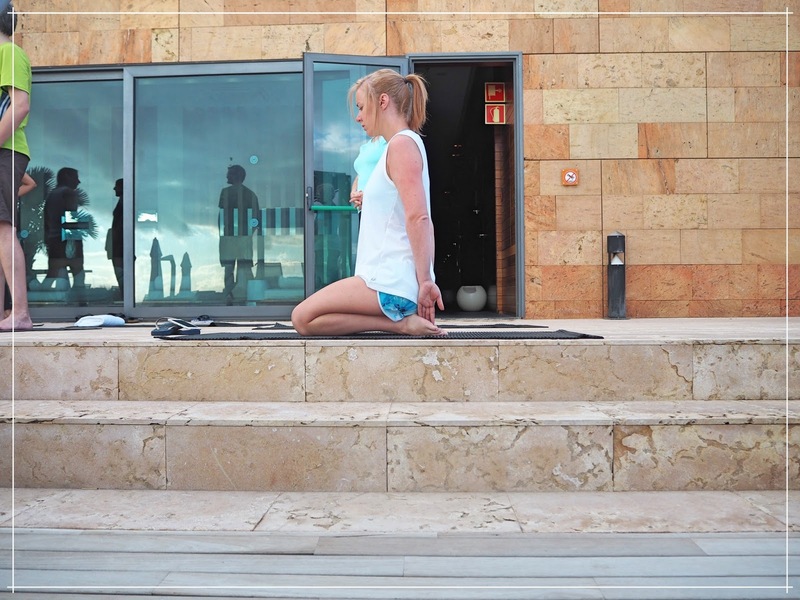 First of all whilst I was on holiday I took part in Yoga most mornings and I found that it was a great way to start the day as it really helped to loosen up tight muscles (and I do have THE tightest hamstrings in the world ever) and also really relaxed me. I totally fell in love with practising Sun Salutations poolside and felt so much more in touch with myself and with my surroundings. Secondly I think I may also be hooked on Barrecorre too. I’ve got a full post coming up on the latest fitness craze to take Leeds by storm tomorrow but on Friday morning this week I woke up to muscle hurting that I didn’t even know existe, I can definitely see how it works and that it will create muscle tone and definition. Bravo Barrecore! My Kit of the Month | I haven’t really invested in much kit this month but since coming home from Gran Canaria I have been using YouTube to continue practicing Yoga and mainly following Cat Meffan’s Yoga flows. YouTube is a fantastic way to discover new workouts and continue your ‘fitness journey’ when you cannot get to the gym. My Meal of the Month One thing that I brought back from holiday with me is a love of food, which I’m classing as a good thing! My new favourite is a Spanish Omelette that I had whilst away and I have recreated a few times since coming home. This is a really comforting and nourishing meal that doesn’t leave me feeling bloated or sorry for myself and packs a lot of flavour thanks to my inclusion of good old Goats Cheese and Serrano Ham. My Track of the Month Time for a little old school throwback for this thanks to one of the instructors at my local gym! All Star by Smash Mouth is such a fun track to workout to, it’s got a great mix of high and low tempo sections that to me make it the perfect warm up track. Plus it always makes me smile! My Goals & Achievements | Although I didn’t hit my pre-holiday target of 53.7kg, I am still working towards it and I was not at all disappointed with the shape I headed away in because I felt more confident in a bikini than I ever have done before. Moving forward I don’t want to let myself slip post holiday as I have done in the past. I want to keep on progressing, achieving and getting fitter, faster and most importantly stronger. I’ve set myself the small target of getting back to my pre-holiday best before the end of October and then I will set myself some new targets.